Synchronised Skating on "Dancing on Ice"
It was an exciting episode tonight on Dancing on Ice with 5x world Champions, Marigold Ice Unity, performing a stunning routine to "Take That", broadcasting synchronised skating to the nation. It’s week 7 on the British version of Dancing on Ice and the theme was synchronicity. Every week, celebrities complete a routine on ice with their professional partner to try to impress the judges and get the British public to vote for them. They also have to complete a required element set by head judges Jayne Torvill and Christopher Dean, which was drawn from synchro this week, with a synchronised step sequence and a double twizzle in line with their partner. The celebrities completed these with various degrees of success during their routines and were then treated to a performance by five times world champions, Marigold Ice Unity to show them how it should be done! Skating to Rule the World in their blue and silver star dresses, MIU highlighted some of the main artistic elements from this year’s rules. 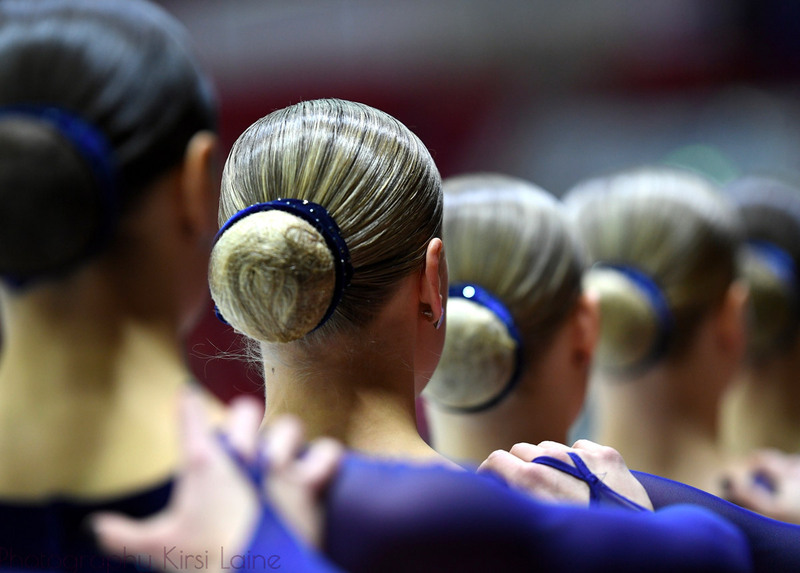 They started in two lines, showing their synchronised edgework then delighted the audience with their group lifts with changes of position and a vault down before showing a straight line and box intersection. From this, they moved into a softly skated weaving circle and even Moves in the Field element on the tiny TV rink. No synchro exhibition is complete without a wheel and MIU did not disappoint. However the highlight was the end with this season’s artistic block with lifts and death spirals which wowed the crowd. Finally, they ended in a star shape befitting the music to much applause from the studio audience. "It truly was an amazing experience for us! The Dancing on Ice family welcomed us with open arms and we couldn’t have wished for anything more. We’re so proud and thankful that our sport was invited to this sensational show! We were lucky to have quite a lot of time to practise on the studio ice rink, so we got used to it and felt comfortable and excited to get to perform live. 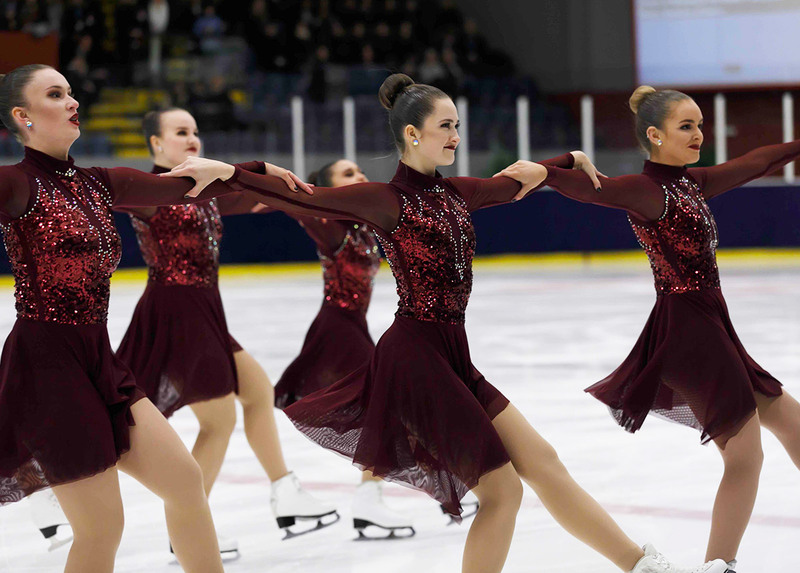 We did do some small changes into the program to get it to fit perfectly to the smaller rink," said the captain Camila Sundren. 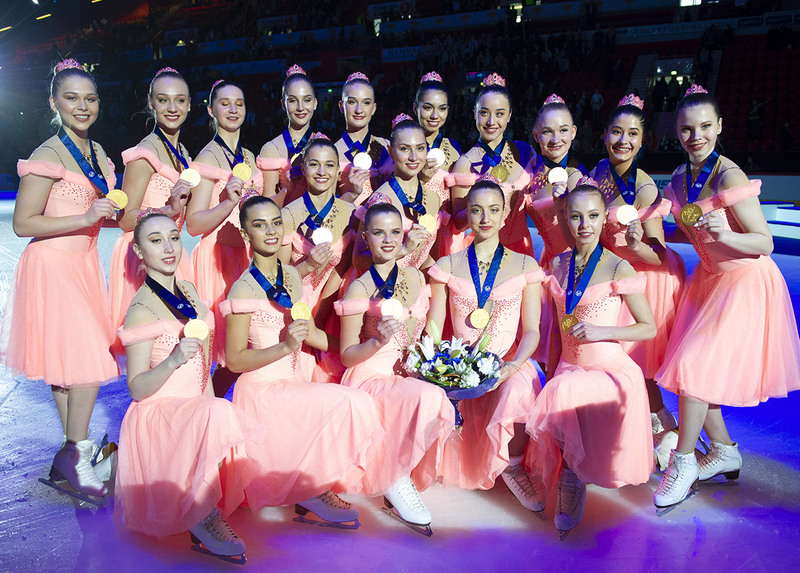 Marigold IceUnity created this program with Anu Oksanen, their coach, in December after their trip to Japan. "After that, we have done a few runthroughs here and there beside training our own programs. Anu suggested a lot of different songs for the program that would suit our last years ”Under the Northern Star” costumes that the Dancing on Ice production wanted us to wear on the show," added the captain a few hours after the show. It was a beautiful performance and it was choreographed cleverly in order to showcase synchronised skating. Anu Oksanen balanced soft skating skills with tricks and highlights that entertained the audience but still remained faithful to the sport. Synchro fans will enjoy the elements and appreciate that it was an exhibition of the discipline, rather than a show number. It was an amazing moment for the sport to be broadcast by such talent to such a huge viewing audience and hopefully the performance will inspire someone, adult or child, to take to the ice and ask to learn how to do synchro. Thank you "Dancing on Ice" for including and promoting our sport and thank you MIU for being perfect ambassadors.